Tests on the proposed Grand Bend Wind Farm indicate it could cause problems for Environment Canada’s weather radar station in Exeter, Ont. a special council meeting heard Wednesday night. Steve McAuley, chief administrative officer for the Municipality of Bluewater, told councillors the tests were checking for any kind of interference with telecommunications near turbines. The consultant’s report, which was commissioned by Northland Power, reportedly found there would be interference and McAuley says Environment Canada has confirmed the findings. Northland wants to put 48 turbines north of Grand Bend, but the report found “All rotors of the wind turbines will be fully visible from the radar platform, causing significant Doppler data contamination during certain wind conditions." 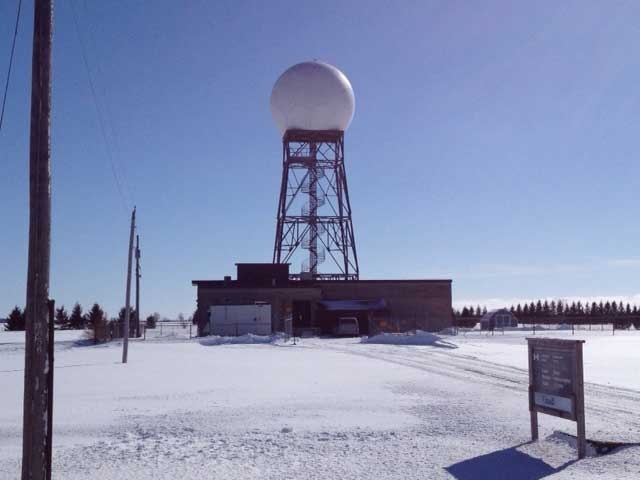 The radar station provides southern Ontario with most of its weather information. McAuley says “The issue is the rotation of the blades, in that it fools the radar into thinking there is some sort of weather system there and my understanding is at this point Environment Canada does not have the computer software that’s able to filter that out like they can some other things." He adds that some form of mitigation will be necessary to allow the wind energy project and radar station to co-exist. The report lists options like the use of specialized stealth turbine blades, moving the turbines, moving the radar station or turning the turbines off on days when Environment Canada needed to us the radar to issue weather warnings. The last option is not popular, given that improving severe weather notification was a key recommendation from the inquest into the death of Normand Laberge during the 2011 Goderich tornado. Environment Canada says this isn’t the only wind farm that could impact its equipment and it is working with Northland Power and other wind companies to find a solution.